Hey, my friends! 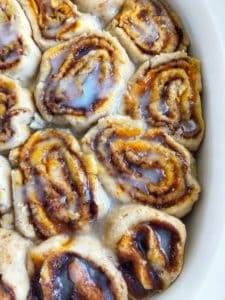 I have been working on a recipe for gluten-free, dairy-free, and vegan cinnamon rolls for a while now. If you didn’t know, gluten-free baking can be so intimidating and adding vegan to that just makes it harder but I am proud of these rolls! Why not add pumpkin to the mix? ‘Tis the season, right? If you aren’t the biggest pumpkin fan then you can omit the pumpkin puree filling! You guys got to bake these ASAP! In a small pot, add the butter and almond milk over low heat till the butter melts. Add 1/2 tsp pumpkin spice to this mixture as well. Add this mixture into a large bowl to cool to room temperature. Once cooled, add the yeast and stir well then set aside for 10 minutes. Then, add the sugar, salt, and vanilla flavoring. Add the flour 1 cup at a time to the milk mixture. Stirring with a whisk in between each addition. Add the rest of the spices listed above to the dough as well. 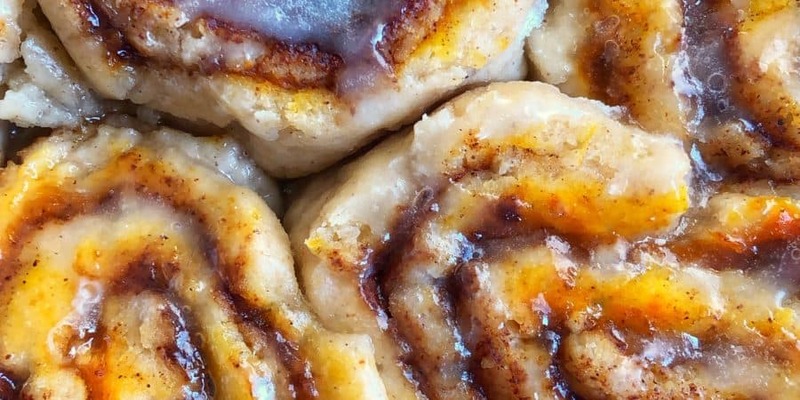 The dough should not be sticky or too wet. If so, add a little more flour. Shape the dough into a ball and cover with plastic wrap. Set aside in a warm place for 1 hour. In the time being, mix together the filling ingredients other than the pumpkin puree. On a clean surface, lay plastic wrap or 2 layers of it to cover a good amount of space. Roll out the dough on a lightly floured surface till its about 1/2 an inch thick. Using a pizza cutter, even out the edges to look like a rectangle. Brush the butter onto the dough. Then spread the pumpkin puree following by generously adding the cinnamon sugar. This is when you would add the chopped nuts if you wish to do so. Roll the dough gently using the plastic wrap to guide you using the long side. Then cut into 2 inch thick rolls then lay them in a nonstick baking pan next to each other. Bake in the oven for about 25 minutes until cooked through. 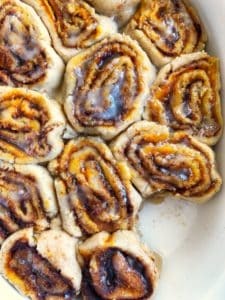 While the rolls are baking, mix the ingredients for the glaze and set aside. 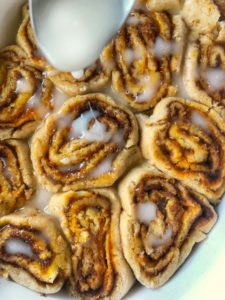 Once rolls are out of the oven, spread the glaze on top and enjoy!